Our friend Paul Graebner adapted this recipe from Sunset magazine years ago, and served it to us for a New Year's Day dinner — and we have been grateful ever since. For a crowd, this is an easy recipe to double (see note below) or even triple. Accompany the crab with a simple salad, lots of good bread for dipping in the delicious sauce, and goblets of white wine. 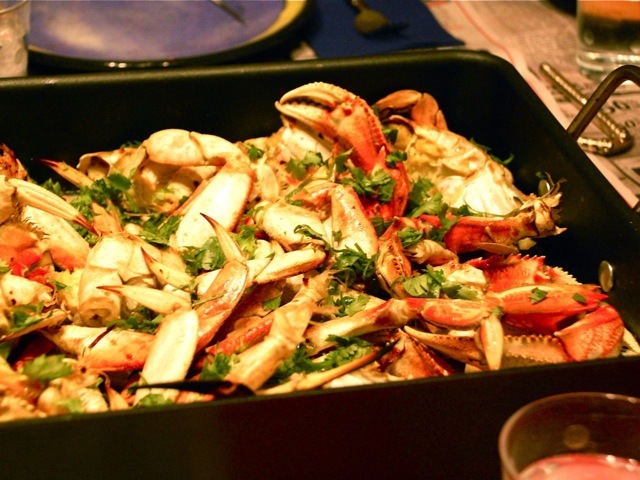 Place crab, butter, oil, garlic, and red-pepper flakes in a roasting pan. Roast for 10 minutes, stirring every 2 or 3 minutes to coat crab with other ingredients. Remove the crab from the oven. Squeeze lemon juice and sprinkle chopped cilantro over the top. This recipe doubles nicely; allow 1 crab for every 2 people eating, although for hungry appetites 1 per person is a better number.